El Pescador (Ambergris), Belize | Tailwaters Fly Fishing Co. Guests travel to Belize City (BZE) on direct flights from Dallas, Houston, or Miami and then connect onward to Ambergris on board a 15-minute hop with local airline, Tropic Air. 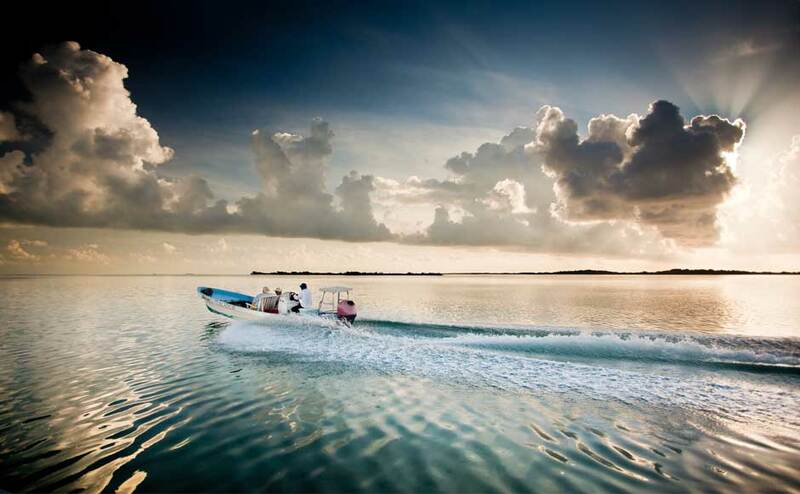 From San Pedro, guests are transferred by boat approximately five minutes north to the lodge. Ambergris Caye has zillions of 1-4 pound bonefish, a vibrant permit fishery, and perhaps the most respected resident and summer migratory tarpon fishery outside of the Florida Keys. Most of the fishing is done from the boat as there is less wading opportunity on Ambergris when compared to other destinations in Belize. Winter weather or cold fronts are seldom an issue this far south, the spring months are the most popular, and the summer tarpon migration attracts anglers from all over the world to enjoy light southeasterly breezes and a shot at the mighty silver king. Hurricane season is technically June – November, however most tropical weather occurs August-October. Fall fishing has a similar vibe to spring conditions and is also a very consistent time to visit. Is El Pescador Right For You? El Pescador is a perfect lodge for those after a “mixed bag” angling experience with legitimate opportunities for multiple species. It is also a great option if you need an easy travel itinerary for a shorter time commitment. It is perfect for those entertaining active non-angling spouses or families with proper accommodations and a diving and eco-tourism program. 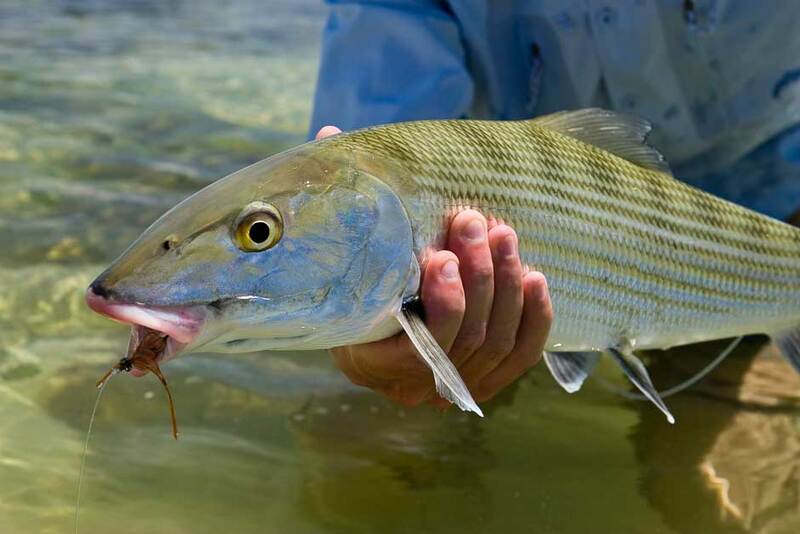 Beginner fly anglers will have tremendous success with Ambergris Caye’s smaller bonefish. If you are interested in sight fishing to tarpon on white sand, there is no better venue outside of the Florida Keys. ***Make sure to inquire about special group rates year round as well as EP’s “2 for 1 Special” that runs July 1-December 15. 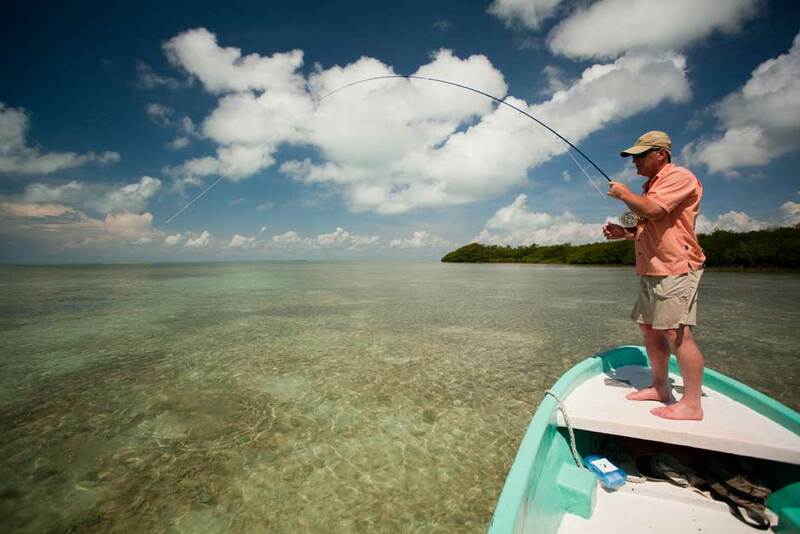 El Pescador Lodge on Ambergris Caye is one of the fly-fishing industry’s most tenured and respected operations. Known for its convenient travel, diverse fishing opportunities, diving program, comfortable accommodations, and laid back atmosphere, El Pescador is one of our all time favorites. The nearby village of San Pedro offers the best nightlife, shopping, and restaurants in all of Belize, adding a social alternative to the solitude of the more remote fishing camps. In addition to a comprehensive eco-tourism program, the lodge also operates a diving and snorkeling outfit that frequents many of the world’s greatest dive sites. The main lodge’s twelve double occupancy rooms are private, recently updated, comfortable and air-conditioned. Guests can also upgrade to beach houses / villas that are ideal for families or guests looking for additional privacy and the added square footage. The lodge’s lively bar (equipped with pool table, darts, shuffleboard, internet, satellite TV) is a nighttime favorite, and the pool and multi-bedroom lodge villas have hosted hundreds of happy children on holiday with the family. Anglers enjoy zillions of uneducated bonefish, frequent shots at permit, and a year-round tarpon fishery that rivals the Florida Keys. 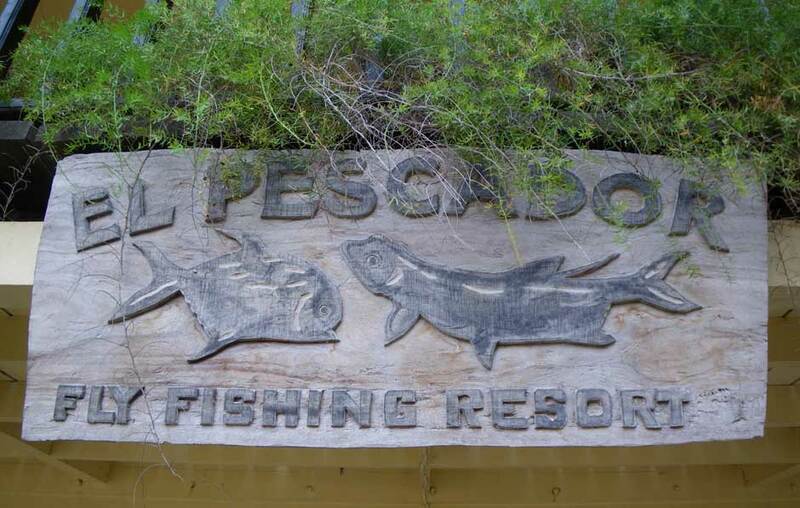 Whether you are looking for a hard-core angling vacation, an intimate family getaway, or hosting a corporate meeting, El Pescador should be at the top of the list. 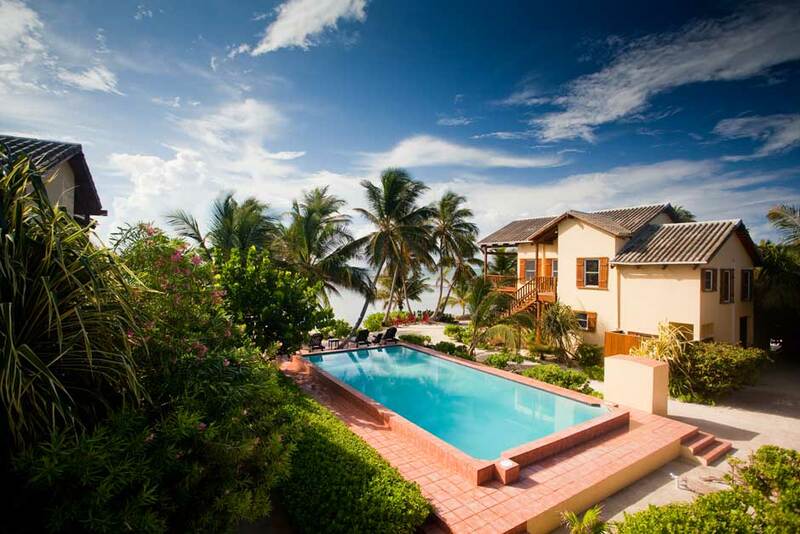 El Pescador Lodge is located on the island of Ambergris Caye, northeast of Belize City. There is perhaps no easier to reach bonefish, permit, and tarpon destination in the Caribbean than Ambergris Caye. A direct three-hour flight from Dallas / Ft. Worth, Houston, or Miami, and a short commuter flight to the island puts guests on the flats or on a world class dive site only a few hours from home. The lodge sits on the windward side of the island approximately ten minutes via water taxi from the energetic village if San Pedro. This family-run resort has enjoyed an international reputation as a world-class fishing destination for over thirty years. Today El Pescador resort is that and much, much more. They specialize in shallow water fishing as well as diving, and also offer the best combination of eco-adventure with luxury accommodations on Ambergris Caye. 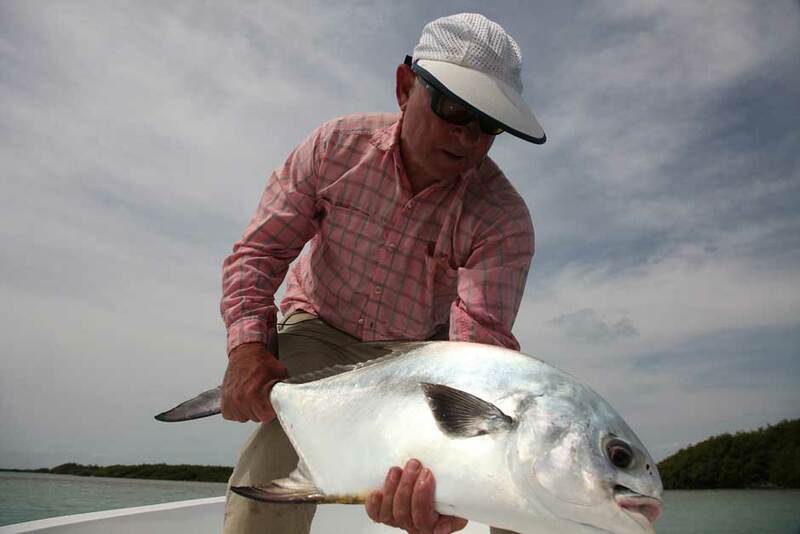 The Spanish name “El Pescador” means “the fisherman” and the lodge caters to all types of anglers, specializing in light tackle, salt water, and fly-fishing with all activities concentrated on the sea as well as on the flats. Weeklong trips are always encouraged, however, El Pescador is the best lodge for a quick, economical, and easy fish “fix.” If you are looking for some of the best saltwater flats fishing or world class diving experience but don’t have the time or think you have the budget to indulge, look no further than El Pescador Lodge. We have been long time friends with the owners, management, and guides at “E.P.” and have sent hundreds of happy anglers, divers, and non-angling companions to El Pescador. More than just a fishing lodge, the operation’s atmosphere and facility, a myriad of organized non-angling activities, and proximity to the lively village of San Pedro make El Pescador an ideal destination to consider for a family retreat or couples vacation as well. Ambergris Caye is one of the few places where anglers can expect to have good consistent shots at a dozen different species including bonefish, permit, tarpon, barracuda, jack crevalle, sharks, and much more. All boats at El Pescador are standard Panga crafts with a broad V-hull capable of running in shallow water with plenty of casting room, comfortable seating, and storage. Bonefish in the 1-4 pound range everywhere on Ambergris. They are often found in huge schools – the perfect classroom for beginners or novice anglers to enjoy success. The soft nature of the flats surrounding Ambergris Caye dictate the majority of the fishing be done from the boat, however there are a few areas that are classic hard, white, sandy bottomed that offer excellent wading opportunities. 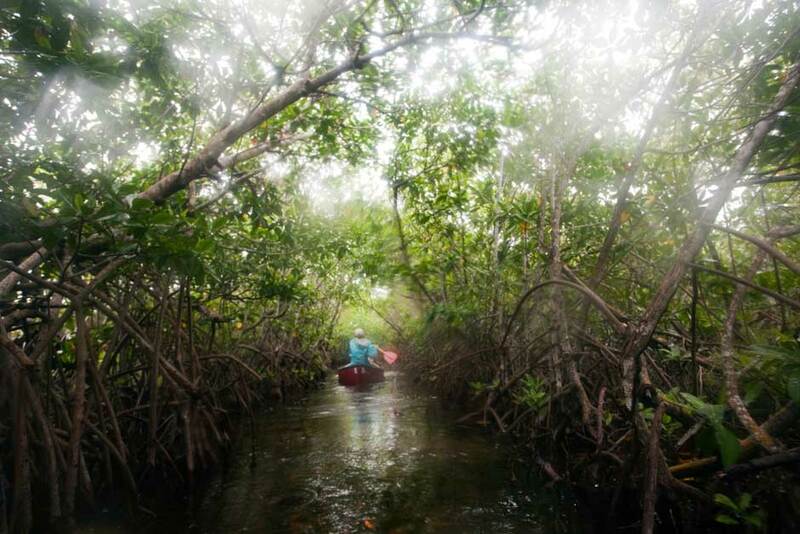 Fishermen also have the luxury of getting out of the wind by concentrating their efforts in mangrove-lined lagoons or inner flats in calmer water. Many anglers come to El Pescador just for the permit fishery. Because this species feels safer and more comfortable on flats within proximity to deeper water, Ambergris Caye offers a perfect habitat for the coveted of the flats species. Ambergris should definitely not be overlooked as one of the world’s best permit fisheries. 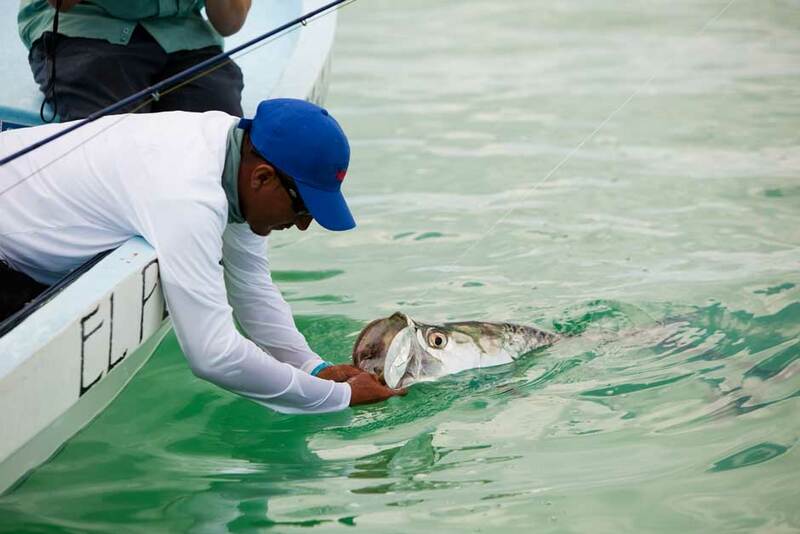 Tarpon are another species that is prevalent at El Pescador year-round. Although juvenile or “baby” tarpon can be found twelve months a year up to 50-60 pounds, perhaps the greatest draw to the island is the summertime adult tarpon fishing. During the summer months (May – September) the larger migratory tarpon often over 100 pounds show up in great numbers. Ambergris Caye is one of the few places on earth outside of the Florida Keys were anglers have consistent chances for sight casting in shallow water on the flats to adult tarpon. Sick of flats fishing or want to catch dinner? El Pescador guests can enjoy fishing the reef for snappers, grouper, wahoo, mackerel, jacks, cobia, barracuda, king fish, rainbow runners, and triggerfish. El Pescador also has several rod and reels for rent set up for all species at guest’s disposal for those who don’t have all the equipment. Their fishing manager can recommend you and your group fish with the appropriate guide based upon your experience and what species you would like to target. El Pescador offers overnight island camping expeditions for those anglers interested in a total outdoor fishing experience. Fish from sun-up to sun-down and enjoy wading the exquisite turtle-grass and sand flats surrounding the island. 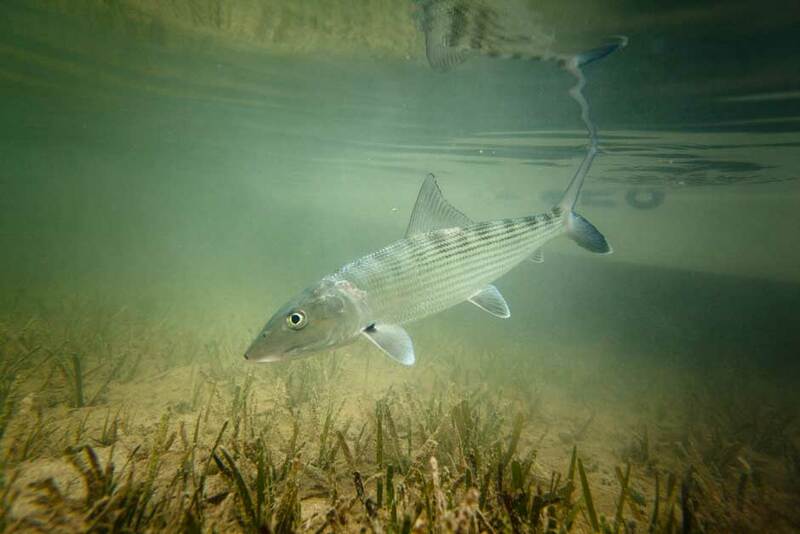 The El Pescador family has purchased Bonefish Island and three other nearby cayes to preserve our flats, which are so essential to the health of their fishery. Their small camp will allow a maximum of 6 anglers with 3 guides per night to wade fish these waters — now protected from development and loss of habitat. The private island overnight camping and fishing expedition is available as an add-on to your regular fishing package or as an optional activity for anglers without a fishing package. El Pescador’s facility is as nice and comfortable as can be found in the world of bonefish lodges, and without question some of the nicest on Ambergris Caye. At El Pescador guests have a choice to stay in the lodge, or in one of the more modern luxury one, two, and three bedroom villas on the property. El Pescador lodge is an intimate hotel set in a colonial style mahogany building with a long verandah overlooking the beach and barrier reef. All rooms have private baths, overhead fans and air-conditioning and are just steps away from the swimming pool adjacent the beach. 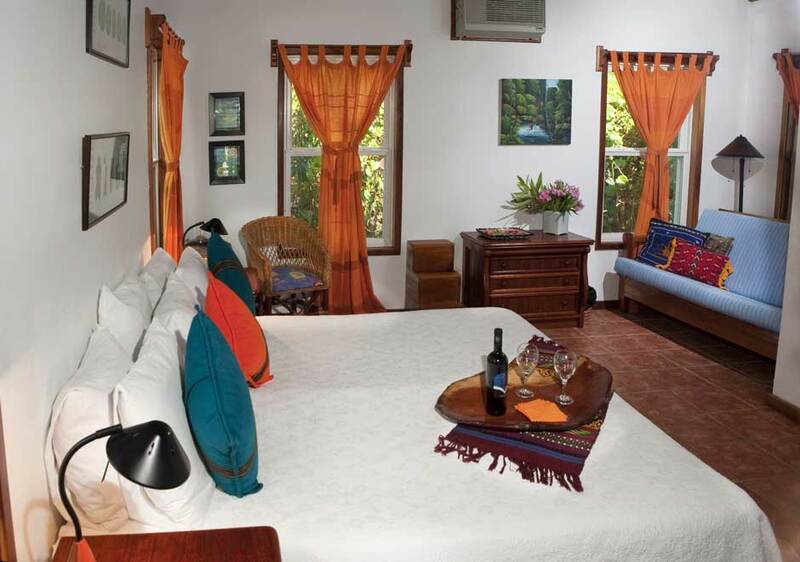 All rooms face the sea on the windward side of the island. Immediately behind the lodge is an expansive lagoon with sea kayaks at your disposal to explore the miles and miles of mangrove lagoons on your own if you have not had enough fishing for the day. El Pescador Villas is a collection of luxury beachfront homes, set in tropical gardens, surrounding a private pool. You may enjoy the entire villa as a home-away-from-home, or request only portions since each suite can lock-off into a private unit. Reserve one master suite, or a master suite and the Great Room — just tell us what configuration works best for your group. The majority of our guests elect to splurge for the villa option. Essentially, guests in the villas are given their own modern and private house on the beach with a kitchen, extra square footage, and a quieter environment to enjoy when not socializing. 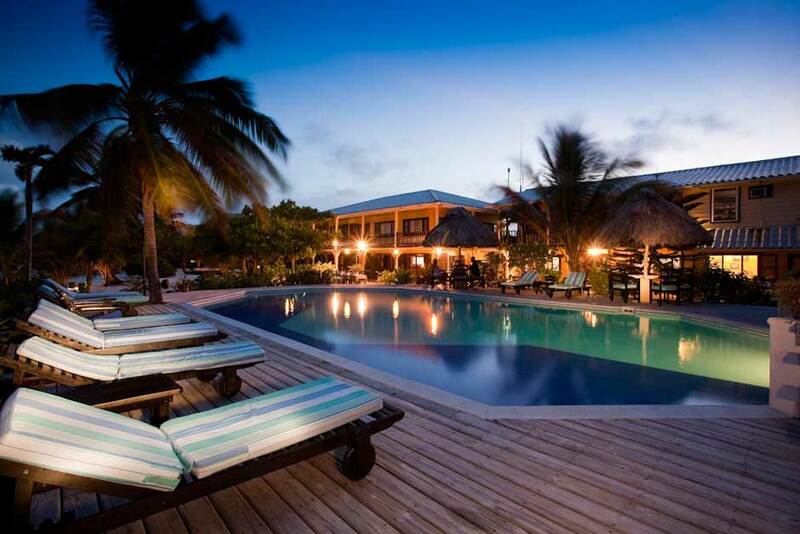 El Pescador lodge and villas are on the Bahia del Punta Arena, 2.6 miles north of San Pedro, Ambergris Caye. The spot is remote and private, yet close enough to reach town on foot, bicycle, shuttle, water taxi or golf cart. The lodge offers complimentary usage of kayaks and bicycles as well as wireless email service throughout and a gift shop. As mentioned, El Pescador also has a very well stocked fly shop with a strong inventory of flies, leaders, sunglasses, and anything else you forgot. The El Pescador restaurant is intimate and serves meals family-style. The kitchen serves an American breakfast, offers a lunch buffet of seafood and local Belizean cuisine, and a dinner buffet. You can join guests and staff for hors d’oeuvres from 5:30 pm in the open air bar with billiards and darts, the perfect place for swapping stories after a day’s activities. The house specialty is tropical rum punch but they also offer a full selection of top shelf liquors, wine, and beer. In addition to the all inclusive meal program at the lodge, we encourage all our clients to venture to one or more of the dozens of excellent restaurants in San Pedro or up the island. A short water taxi ride gives guests at “E.P.” the ability to experience a great meal as well as some of the local nightlife. We will provide you with several recommendations for restaurants on Ambergris Caye in our outfitting guide upon booking. Only a three-hour, direct flight to Belize City, there is no easier destination in the saltwater world to reach. Guests of El Pescador fly into Belize City, which is serviced with direct flights by both American and United Airlines from DFW, Houston, Miami, New York City, and numerous other origins. Upon arrival into Belize City, guests hop on a short fifteen minute flight aboard local carrier Tropic Air to the city of San Pedro, Ambergris Caye. Several flights a day depart Belize City for San Pedro, so connections are usually no more than a few minutes. A representative from the lodge will meet you at the airport and transport you ten minutes by water taxi to the lodge’s pier. Travel to Belize City. Upon arrival in Belize City, check in with flight to San Pedro for the 15-minute flight to the island. Guests are picked up at airport and transferred to lodge via five-minute water taxi. Relax the rest of the afternoon. Fish, Scuba Dive, and enjoy the numerous activities available at El Pescador. Enjoy first class meals and beautiful Caribbean weather. No activities are typically planned for the day, however depending upon when your international flight is scheduled there may be time for a ½ day of fishing or diving. Guests are transported back to the San Pedro airport for the short commute back to Belize City and on to the United States. El Pescador is open year round, and Ambergris Caye enjoys excellent fishing conditions more or less all year. Belize has a subtropical climate that is uniformly hot and humid, although it is tempered by the trade winds. The dry season is from February to March with another brief spell during August, while the hurricane season is from late July to October. Temperatures during the summer months can become extremely warm, and anglers who are especially bothered by heat may want to consider avoiding the summer. However, do know that El Pescador has extremely comfortable fully air conditioned facilities to get out of the heat on a hot summer day. A nice sea breeze helps to keep things comfortable during the summer months as well. El Pescador offers a unique mix of non-angling activities from visiting the zoo, having a BBQ picnic on a secluded beach, and of course snorkeling and scuba diving. There are also two swimming pools at the lodge as well as complimentary use of bicycles and sea kayaks. Please view the other activities listed below and inquire for current rates. El Pescador is known as much for its SCUBA program as it is for the fishing program. Guests on a non-angling package may book a day or two diving, and complete dive packages are also available. Ambergris’ locality a quarter mile from the second largest barrier reef in the world makes for a wonderful and complete diving program with short boat runs and some of the best dive sites on earth. Guests can gain PADI certification at the lodge and all the equipment is provided excluding masks, snorkels, and regulators which are rented for a very nominal fee. This zip line tour starts in the limestone foothills of Belize. You’ll hike into the rainforest and begin your tour 80 feet above the forest floor. Secured by a body harness and protected with a helmet and gloves, you’ll be attached to a steel cable and travel the zip line between eight separate tree platforms. It’s an exhilarating experience with spectacular views and a perspective you won’t get anywhere else. This par-72 golf course is the only full size golf course in Belize. Designed by Larry Addington, this long, flat course has four par-5 holes and plays to over 7000 yards. The developers utilized a special hybrid grass imported from the U.S. that requires less fertilizer, irrigation and pesticides to maintain. Float on an inner tube as the river winds its way through the rainforest and into caves containing spectacular crystal formations, the very entrances to the ancient Maya underworld. Then travel to the world famous Belize Zoo to see wilder residents, up close and in their natural settings. Meet a local celebrity, April the Tapir, Belize’s national animal, as well as howler and spider monkeys, scarlet macaws, a variety of crested birds, deer and wild peccaries, and 5 species of cats including the elusive jaguar. Visit the Mayan ceremonial and trading center, Altun Ha, where the largest piece of carved jade in the Mayan World, the head of the Kinich Ahau, the Sun God, was discovered. After a Belizean lunch continue on to the Baboon Sanctuary to see black howler monkeys in the wild. Or do the Belize Zoo instead of the Baboon Sanctuary. Enjoy the animals at the Belize Zoo and then discover Belize’s plant life en route to St. Herman’s Cave. End the afternoon with a cool swim at the inland Blue Hole, a dazzling freshwater cenote. A paradise for birders, Crooked Tree Bird Sanctuary is managed by the Belize Audubon Society. Local residents provide guide and boat services. You’ll see more birds by boat, but there are walking trails throughout the sanctuary as well. Experience the stunning beauty of the Mountain Pine Ridge and its Hidden Valley Falls. Hike through Bol’s Caves and swim in the Rio On Pools. It’s an unforgettable experience. One of the largest and oldest Mayan sites in Central America, the Lamanai Mayan Center consists of more than 800 structures. Archeologists believe this center of Mayan civilization was settled as early as 1500 B.C. Fish the reef for your “catch of the day” and have your guide Barbeque it on a beautiful, secluded beach. Snorkel, collect shells, or simply relax in the sun while on your picnic is prepared. Spend the afternoon on the beach or try more fishing! Enjoy the underwater wonders of Belize. The second largest living coral reef in the world is host to a variety of species including sharks, rays, eels, grouper, parrot fish, trigger fish, sea horses, turtles, shrimp, sea fans, coral and many other wondrous aquatic life forms. No personal gear such as BCs and regulators are included. Must be certified to dive. Certification Courses available. Snorkel on your way to Rocky Point, a beautiful part of the island where the reef and the island meet. 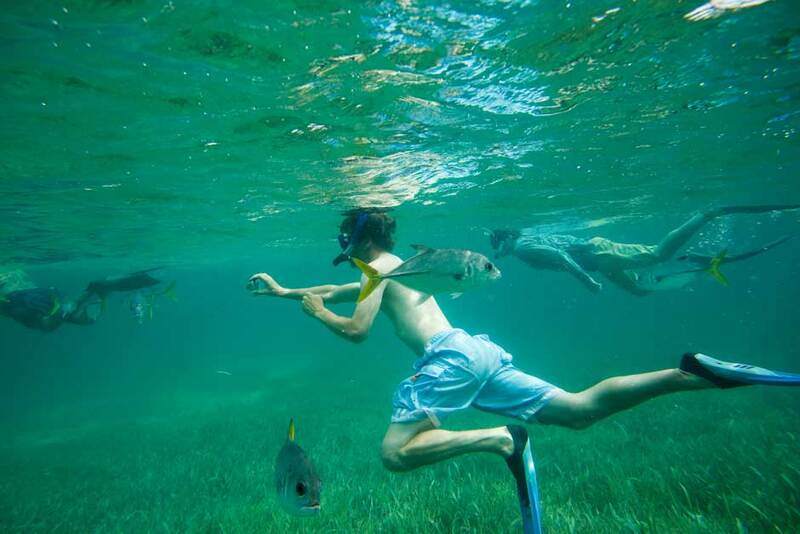 This spot offers excellent opportunities to wade for bonefish, snorkeling or collecting shells. Enjoy a romantic beach picnic. Includes lunch, drinks and 2 snorkel stops. Visit the neighboring island of Caye Caulker, located 10 miles south of Ambergris Caye. Enjoy this quaint, fishing village or snorkel the famous Hol Chan Marine Reserve. Swim with nurse sharks and stingrays and stop at coral gardens. Includes 3 snorkeling stops, rum punch and sodas. Visit a secluded mangrove island outside of Belize City, a natural habitat for the West Indian Manatee. View the shy manatee as it comes up for air or just long enough for you to snap its photo. Stop for a picnic lunch at a small island with snorkeling nearby. Visit the neighboring island of Caye Caulker and enjoy another snorkeling stop at Calabash Point. Additional activities can often times be scheduled and paid for while at the lodge. However, if your group has a specific interest in a certain activity we advise you to book it in advance to ensure availability. Ask for details and know that we have only listed a handful of the dozens of options available! Tailwaters Travel must adhere to the cancellation policies of the guides, outfitters and lodges which it represents. El Pescador Lodge’s policy follows: A non-refundable deposit of 50% per person is required to hold both space and guides on all packages. No space or guides will be held without receipt of deposit. Full pre-payment is due at El Pescador 90 days prior to arrival. Prior to 90 days 100% of deposit may be transferred to another date/angler. Between 45 – 90 days 50% of package may be transferred to another date or angler. Less than 45 days may not be transferred or refunded. All cancellations have a $100 processing fee per guest. Refunds of deposits/payments made on credit cards will be charged a 3.5% service charge to fully compensate Tailwaters Travel for all bank charges incurred. Receipt of deposit and/or final payment is acknowledgement that registrant has read and accepts the cancellation, refund and responsibility clauses.